The Bang Pakong River in Thailand originates at the confluence of the Nakon Nayok and Prachin Buri rivers and winds its way through Chachoengsao province finally ending its journey in the Gulf of Thailand some 150km’s downstream. 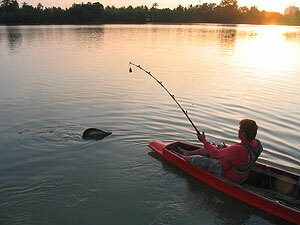 The Bang Pakong River is one of Thailand’s best known Giant freshwater stingray fishing destinations and has produced stingrays to world record proportions to Fishsiam guides and clients. The river is also known as the ‘River of the dragon’. The town of Chachoengsao is situated on the low plains and is known commonly amongst the locals as ‘Paet Riu’.The name Paet Riu has reference to the large catches of fish that were caught in ancient times by the local inhabitants. Chachoengsao is situated 80km’s east from Bangkok and is home to one of the countries most spectacular temples ‘Wat Sothon Wararam Woravihan’ which dates back to the Ayutthaya period and is of great religious and cultural importance. The river is one of the countries five holy rivers which were traditionally used to mark the king’s ascension to the throne. Chachoengsao province is located in a low river basin and the surrounding area is rich in rice fields and mango orchards. The estuary close to the river mouth is covered by mango forests and is home to a myriad of wildlife. In the rivers lower reaches the depth of water and flow change considerably with daily tidal influxes making the water brackish in content. Irrawady Dolphins are regular visitors to the estaury part of this river in its lowest reaches where they pursue bait fish from the Gulf of Thailand into the rivermouth. The dolphins are regular visitors and trips can be arranged to view them as they socialise and feed in the estuary. 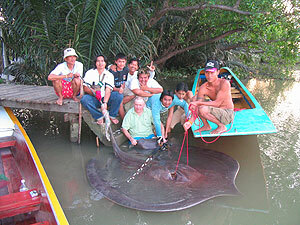 Target species on the Bang Pakong are the awesome Giant Freshwater Stingray, in addition to various other members of the ray family and Sea Catfish. Fishing times on the river are dictated by lunar phases and tidal predictions giving the angler the maximum potential of doing battle with one of these mighty beasts! Giant prehistoric predators of mythical proportions lurk in the depths of the mighty ‘River of the Dragon’ as well as a real sense mystery and the unknown. Due to the Fishsiam teams recent captures (2008-2009) this river has featured heavily in the press recently with the National Geographic explorer Dr.Zeb Hogan and news writer Stefan Lovgren joining the team to conduct research on Giant freshwater stingray. The Fishsiam team whilst fishing with Zeb Hogan from National Geographic at the Bang Pakong River would go on to witness an incredible ‘natural world first’ when during the handling of a large female Stingray captured by the team, a live newborn ray was born measuring a mere 34cm. This was a highly encouraging sign for this massive tidal river and good news for such a highly obscure and understudied species. The Fishsiam team has accounted for numerous monster Stingrays whilst fishing at this incredible venue,with record breaking weights to an estimated 220kg. Stingray Fishing at this river is the ultimate freshwater adventure fishing experience allowing visiting anglers the opportunity to fish for what is probably the largest freshwater fish in the world. This amazing tidal river location has suffered from pollution in 2010 caused from the major flooding in the Bangkok region. The river suffered fish losses and fishing quality was impacted, the venue is now making a recovery with reports of stingrays being caught again in the last two years. The Bang Pakong river still represents a good chance of catching these River Monsters and certainly still holds some monster record breaking fish. Anglers fishing at this tidal river should not expect non stop action and be prepared to wait in some instances days between fish. But with the chance of a potential world record waiting in this amazing tidal venue the draw will always be there for the more adventurous angler. This amazing big fish venue can be combined in one of our weekly angling holidays or visited on a daily basis. For more information about this venue or about our Thailand stingray fishing packages at the Bang Pakong River contact us using the button below.